Hey, I just wanted to let everyone know about Benefit’s new advent calendar in case ye didn’t know already. Basically, Benefit’s new product the “countdown to love” advent calendar is just like a regular advent calender except each day you open one of the little doors you get a mini Benefit makeup product instead of chocolate. I was so excited when I heard about this, I just think that it is so cool to have an advent calendar but with makeup instead. It is pretty expensive and is retailed at around €75 in Ireland. It contains 21 small benefit makeup products, a horseshoe charm bracelet, a star charm necklace and a ribbon bow barrette. This is such a large amount of money to pay for a lot of mini product but it is a fantastic way to try out lots of the different Benefit products if you don’t know what Benefit products to go for or haven’t tried anything from Benefit before. This is very special limited edition advent calendar and I think they are already sold out in Ireland but I’m not sure about other countries. There are no more in stock on the Benefit website but I just wanted to let you all know about it because I just think that the idea of it is so cool and I’m glad that I found out that products like this existed around Christmas time. Benefit did one of these last year and I’m sure they will do more next year so if you want to get your hands on one of these products but they are already sold out in your country, you can go to your local Benefit counter in late October or early November next year and I hear that they take names for who is going to get a limited edition advent calendar because they don’t make that many so you need so order them in advance. Sorry this post might be too late to help some people get a Benefit advent calendar this year but I still think that it’s good to know they exist now so that at least you can order one next year if it comes to it. 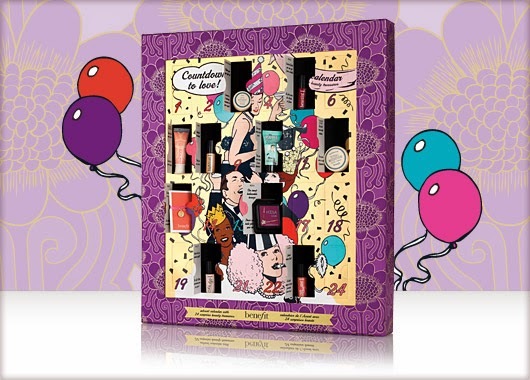 Click here for full details of what products are in this calendar which is shown on Benefit’s website.